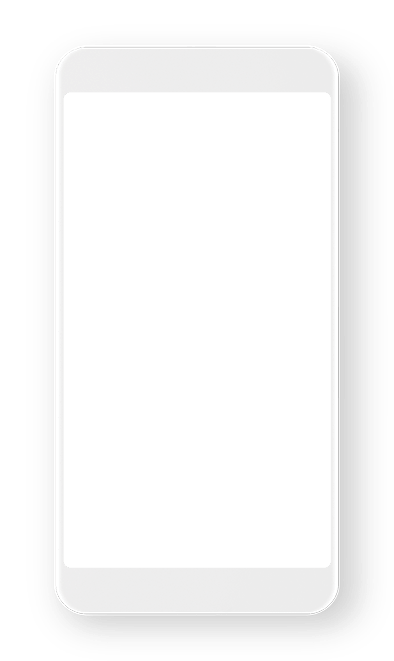 For emerging artists, the Best New Artist award at MTV’s Video Music Awards is an enormous opportunity to break through to new audiences. Not only is it a career game-changer for artists, it’s also a fantastic way for fans to participate in the awards show. 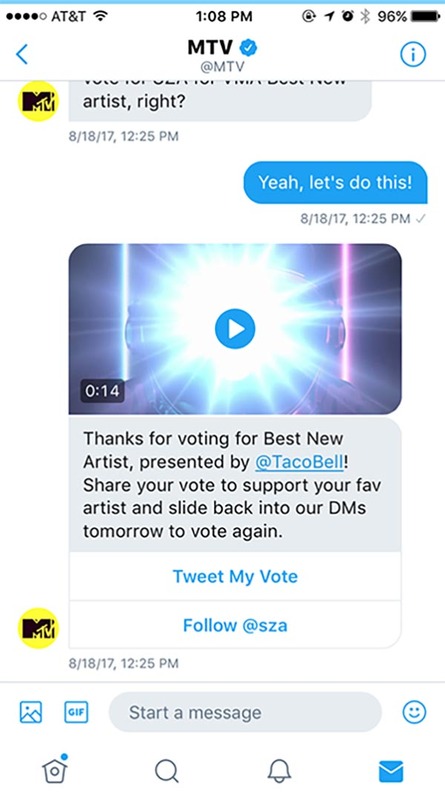 In 2017, MTV (‎@MTV) and Taco Bell (‎@tacobell) teamed up to create a unique experience on Twitter that would let fans vote for their favorite nominated artist in Direct Messages. MTV used a Direct Message chatbot that would allow people to vote for their favorite new artist, all on Twitter. The chatbot also encouraged fans to share their vote with their followers via a Tweet and encourage them to cast a vote. Fans could vote for a week leading up to the pre-show. After that, the top two contenders competed in a head-to-head hashtag vote, with the ultimate winner crowned during the main show. MTV and the Twitter Content Partnerships team worked with Taco Bell to sponsor the experience. 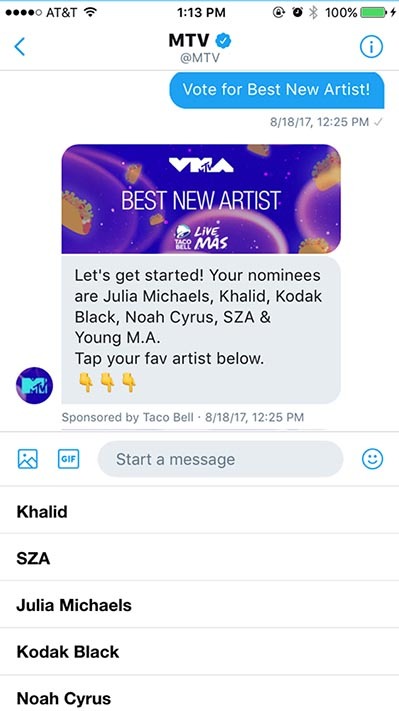 Taco Bell used the Direct Message Card to create Promoted Tweets that showed up in the timeline of people interested in MTV, the VMAs, Taco Bell, the nominated artists, and music to let them start voting in a single click. Taco Bell used Twitter’s robust targeting options to find the right people and engage them in a tailored voting experience. Taco Bell used video in the Direct Message Card to grab people's attention and compelling calls to action to entice people to vote. To create an experience that could allow tens of thousands of people to vote, Taco Bell and MTV built a chatbot to automate conversations. The chatbot used a welcome message to let people know about the voting experience. Quick replies made it simple for them to understand who was nominated and then cast a vote. Keep fans engaged and drive sharing. The chatbot replied with a video after voting featuring the artist the person voted for. The video encouraged people to Tweet their vote, calling on their followers to vote as well. The shared Tweet featured a custom video in the Direct Message Card that showcased the artist they voted for. After a close voting battle, Julia Michaels (‎@imjmichaels) and Khalid (‎@thegreatkhalid) emerged as the top two contenders, with Khalid winning the title of Best New Artist. The campaign was award-worthy as well. More than 54,000 people cast their vote with the chatbot — making up 77% of everyone who engaged. Most impressively, people sharing the experience with their followers organically increased voting by 25%, and earned them twice as many organic impressions as MTV’s own Tweets. Brands are connecting with people on Twitter in unique and creative ways. And so can you.